Shihan Jim Stackpoole began his study of the martial arts in 1960, being taught Judo by Desmond de Vene as a teenager. As his thirst for knowledge of the martial arts broadened, he branched out into Karate and Jujitsu, with the latter being his favourite activity. He became a student of Sensei Ray Stevens, and practised with him during his many visits to the Sandgate Judo Club in the mid to late 1960s. In 1966, he opened the Kyushin Jujitsu Club at the Aspley State Primary School. As many of his students expressed the desire to compete in open competition, he sought to join an association of other practitioners. Unfortunately, during those days, there were very few Jujitsu practitioners in Queensland, so he was compelled to change the name of the club to the Kyushin Judo Club, and joined the Queensland Judo Association. This required several changes to his teachings, so that the students would not suffer disqualification for using lethal Jujitsu techniques during Judo competitions. This school still exists today, and is now located at Albany Creek. In 1968, he travelled to Japan and resided with Mr Nakano, studying Judo and Jujitsu, while living as a traditional Japanese. He undertook a Jujitsu grading after competing in the Yamaguchi Prefecture championships, and was promoted to Shodan (in a five dan grading system). In 1972 he was appointed as the unarmed combat instructor at the Queensland Police Service Academy. Between 1972 and 1977, he taught Jujitsu techniques to recruits and prepared a system of policing arrest and restraint techniques which are still taught today. In 1974, he returned to Japan and again studied with Mr Nakano and was promoted to Nidan. Since that date, he has resided in various parts of Queensland, and continued practising and teaching Jujitsu and Judo. He has been promoted to the rank of Shichi Dan (in a revised 10 Dan system). He has trained extensively with disciples of Dr A.J. Ross, who is credited with founding the first Judo and Jujitsu school in Australia in the mid 1920s. Many of Dr Ross’ students, such as John Lee Jones, Buck Samrai and Joe Elkenhans are exponents of the Yoshin Ryu style, and continue to teach the ancient techniques. As such, they are among the longest serving Judo and Jujitsu practitioners in Australia. In the early to mid 1970s, he trained with Sensei Mike Jeans, who later became the President of the Australian Society of Jujitsuans. This liaison assisted him in making slight adaptations to the syllabus to form a ten dan grading curriculum, so registration with the national body could become a reality. Over the last 20 years, Mr Stackpoole has resided in various places in Queensland – Rockhampton, Mount Isa, Townsville, Innisfail, Cairns and the Gold Coast – where he has opened Judo and Jujitsu clubs and taught many keen students. The Kyushin Ryu style of Jujitsu has long and firm traditional ties to the art practised by the shoguns, many centuries ago. As such, there have been few alterations to the traditional techniques, with the exception of adherence to a code of safety to meet contemporary litigative demands. 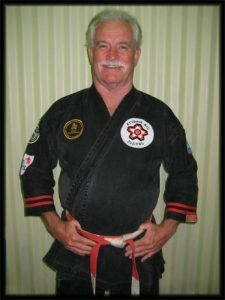 Mr Stackpoole has accepted the title of Shihan as the head of school, but is quick to point out that the style retains the traditions of its founders, and is not a recent formation of his own techniques and ideas.